The Stony Brook men’s and women’s cross country teams both came in second place at the America East Championships on Saturday, Oct. 27 in New Hampshire. The leading runners for the men’s team were juniors Cameron Avery and Vann Moffett, who finished in third and fifth place with times of 24:43.01 and 24:48.69, respectively in the 8,000 meter race. Seniors Michael Watts and Darian Sorouri, junior Greg Mangarelli and senior Kevin Vinolas all finished together, coming in 11th through 14th with times of 25:02.88, 25:05.64, 25:20.59 and 25:20.96, respectively. Avery and Moffett were both named to the All-Conference First Team, and Avery also won the Elite 18 award, given to event medalists with the highest GPAs. Watts, Sorouri, Managarelli and Vinolas were also named to the All-Conference Second Team. The team, however, finished with 44 points to UMass Lowell’s 45. For the women’s team, seniors Annika Sisson and Tiana Guevara finished in second and sixth place respectively with times of 17:17.62 and 17:34.18 over 5,000 meters. Junior Alexandria Ortega finished in 14th place with a time of 17:55.31. 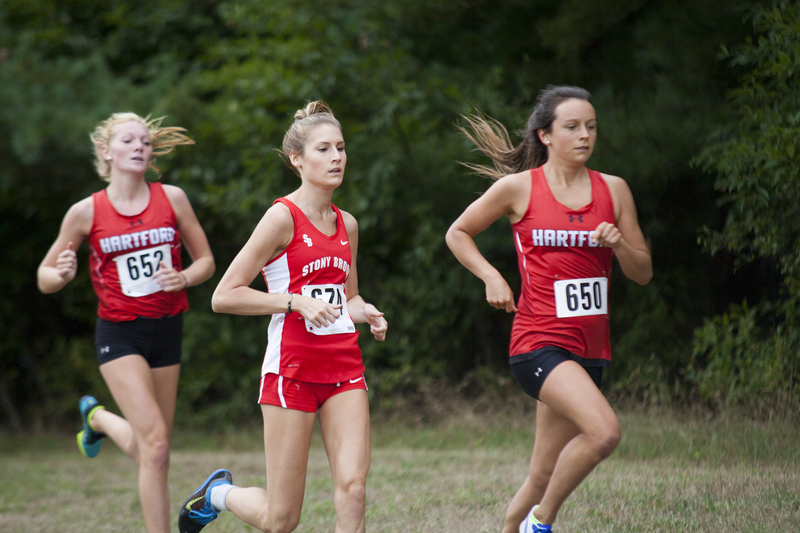 Senior Talia Guevara, juniors Clodagh O’Reilly and Holly Manning and freshman Klaire Klemens finished 18th through 21st with times of 18:03.64, 18:07.78, 18:08.79 and 18:09.96 respectively. Sisson and Guevara were both named to the All-Conference First Team and Ortega was named to the All-Conference Second Team. The team fell 13 points short of Albany’s 72 points with 59 of their own. Ronan, along with assistant coaches Jason Headman and Howard Powell, won Coaching Staff of the Year for their efforts on the women’s team. The Seawolves return to action when they travel to the NCAA Regional Championships in Buffalo on Friday, Nov. 9.